The enzyme which does the work of “reading” a gene on the DNA and building a corresponding gene of RNA is called RNA polymerase[ref]In fact, there are several forms of RNA polymerase, but that complexity is well beyond the scope of this document.[/ref]. There are at least four types of RNA and transcription makes them all. For protein synthesis, the RNA constructed is called mRNA, or messenger RNA. The DNA recipe begins with a sequence called the promoter. 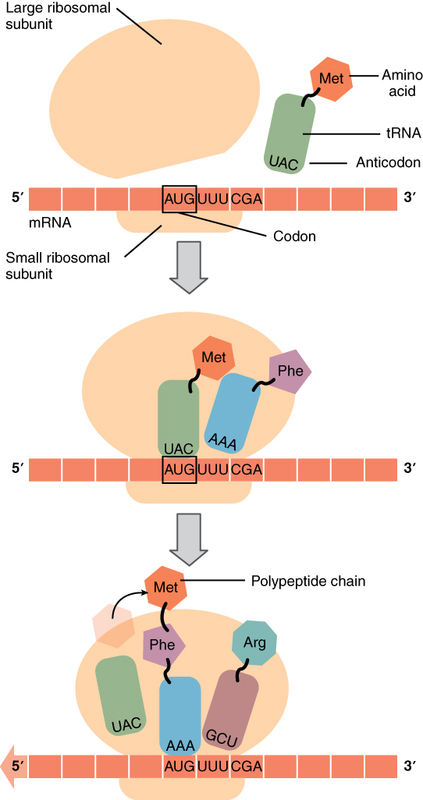 RNA polymerase contains a complementary sequence which binds to the promoter and launches transcription. As will soon be seen, transcription is started only if it is allowed by gene regulation. RNA polymerase unwinds a part of the DNA chain and reads code-words, starting with the promoter. As it reads the DNA, it constructs a complementary chain, called pre-mRNA, from nucleotides. It is complementary in the sense that if the DNA contains a C (or A or G or T) then the pre-mRNA contains a G (or U or C or A – remembering that RNA replaces T by U). A molecule of tRNA is a molecule of RNA folded into a double strand with loops which give it a precise 3-dimensional shape. 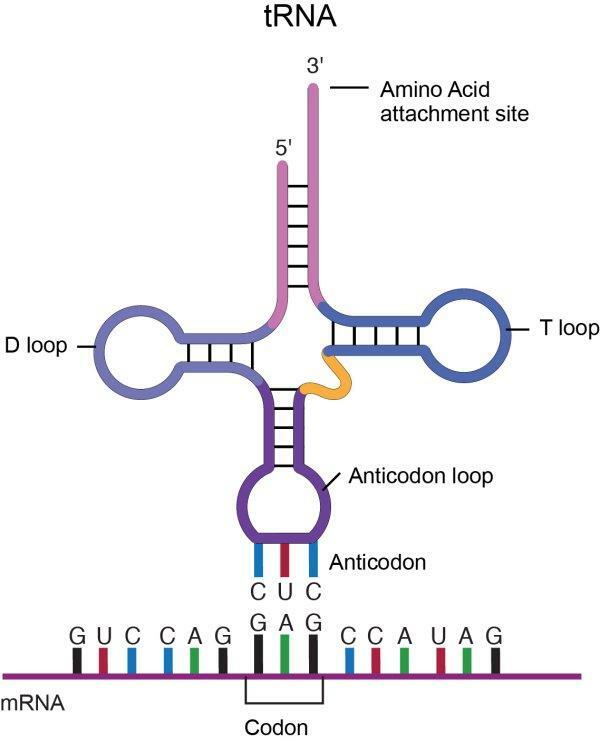 The loop on one end has an anticodon, the function of which is to match its complement codon on mRNA. The other end has a binding site (adenylic acid) for a specific amino acid. So the tRNA is the “dictionary” which converts codons into amino acids[ref]This of course poses the question, where do the tRNA molecules come from? Good question.[/ref]. A tRNA molecule is “charged” with an amino acid molecule by a tRNA-activating enzyme which uses energy from ATP to covalently bond the appropriate amino acid from molecules in the cytoplasm. Such tRNA molecules, carrying an amino acid, are called aminoacyl tRNA. The second part of this process depends on the presence of glucose and is regulated by a second DNA-binding protein, CAP (catabolite activator protein). CAP is also an allosteric protein with one DNA-binding site and one allosteric site which binds to cyclic AMP (cAMP). CAP is only active when it is bound to cAMP. You guessed it, cAMP levels are high when glucose levels are low. [ref]If we go one step back, we see that glucose binds to an allosteric site on the enzyme adenylate cyclase, which makes cAMP from ATP, and disables it. So lack of glucose stimulates production of cAMP, which binds to CAP, which binds to the promoter to enhance synthesis. 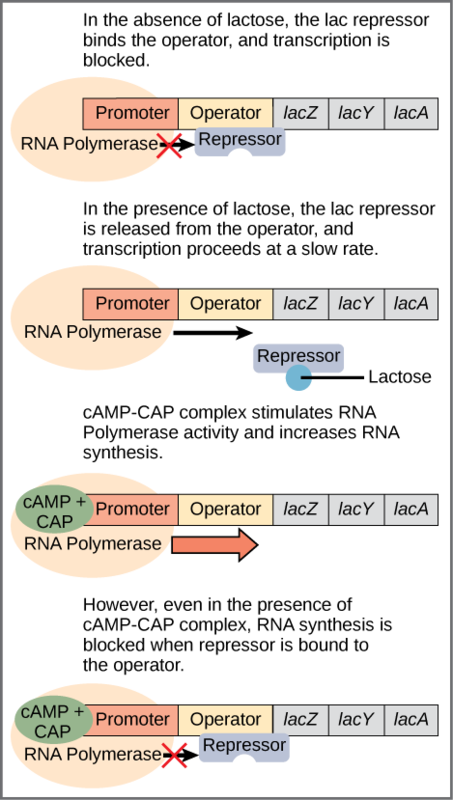 [/ref] In that case, cAMP-CAP binds to the promoter and enhances transcription of the genes. So lactose can be considered the “on-off” switch for transcription of genes for lactose-digestion and cAMP-CAP, the “volume control”. Inside the nucleus, histones, around which chromatin is wound to make nucleosomes, can wind or unwind to change spacing of the nucleosomes and thereby allow or deny access to genes. This process is a form of epigenetic regulation. [ref]Look out, epigenetic regulation is used for somewhat different notions, too, and they are not all necessarily so. [/ref] Since histones are positively charged and DNA, negatively, modifying the charge by adding chemical “tags” to either modifies the configuration of the DNA. 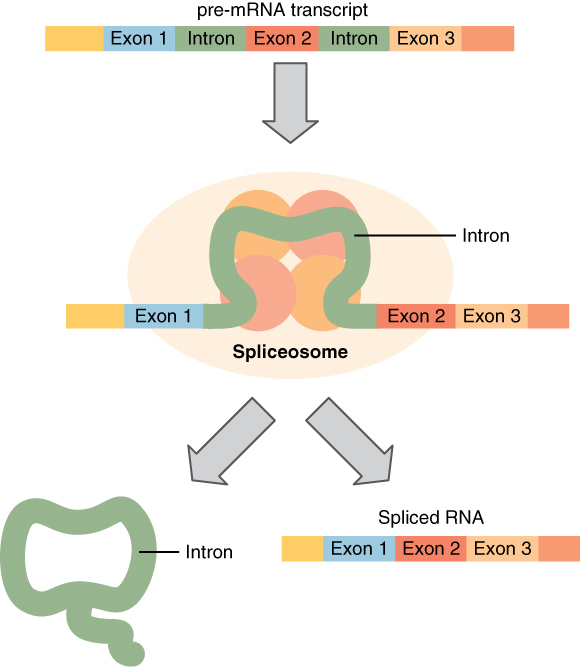 The above figure shows the case of an enhancer bound by activator transcription factors. [ref]The bobby-pin curl is an idealization; DNA shapes are far more complex than that. 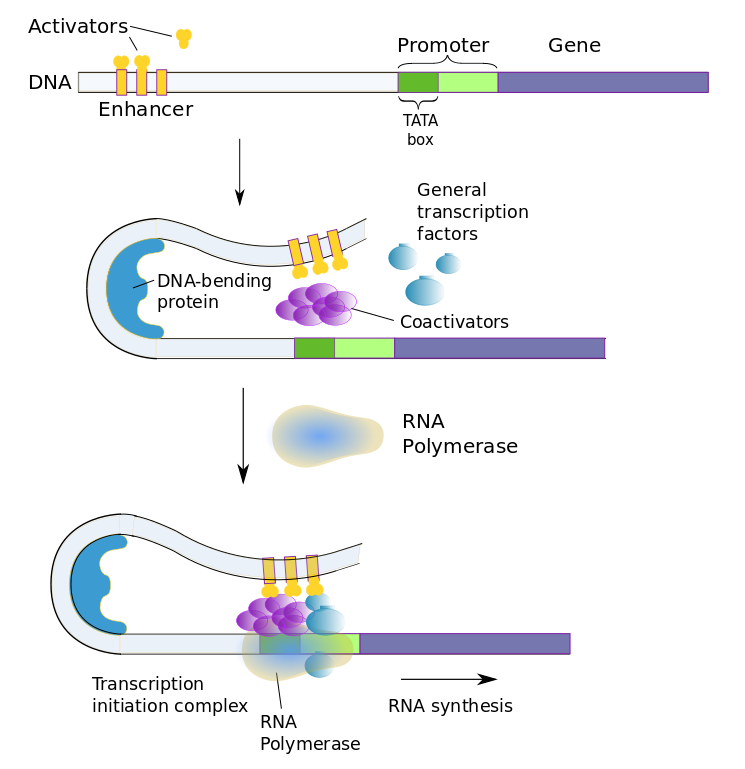 [/ref] The enhancer, on the left, originally is quite far from the promoter, until DNA bending causes it to change its shape, allowing the enhancer to come in contact with the promoter and the rest of the transcription-initiation complex. Many animals have a disposition of body parts along an axis, such as the antennae, wings and legs along the body axis of a fruit fly, or the existence or not of ribs along the vertebrae of a vertebrate animal. It turns out that the choice of body part at each segment along the axis is regulated by a transcription factor coded by a single gene – the Hox gene. Hox genes are an example of homeobox genes; they contain the homeobox sequence. These Hox “master” genes control the developmental differentiation of, for instance, a fruit fly’s serially homologous body parts;[ref]The front legs of a cat and our arms are considered homologous body parts. Structures along a body axis, similar but different, are called serially homologous with respect to each other. [/ref] in simpler terms, its body pattern. They are “master” genes because they determine whether a given part will form or not, leaving the details to genes farther down the chain. But such “detail” genes will not function at all without the “master” gene, which therefore regulates quite a large number of genes. Hox genes are sufficiently similar that introduction of mouse Hox genes into a fly can cause the growth of the indicated organ — in fly format. They also control the very different serial structure of snakes. Homeotic genes occur in clusters. One more amazing fact is that the genes of a cluster are in the same order as that of the body segments they control. It is sufficient to replace the gene in a given cluster, say at the antenna position on a fruit fly, with another, say a leg gene, and a leg develops at the antenna position on the fly. Since the transcription factors coded by such genes can change the cells they regulate into something else, they are called homeotic[ref]Homeosis is the transformation of one organ into another. [/ref] transcription factors and their genes are homeotic genes. The protein domain they express is therefore a homeotic domain, Hox, for short. Stem cells are those which may split and form any kind of cell. [ref]Usually to make an identical stem cell and another cell, which may or may not be a stem cell. [/ref] But once a specific type of cell is made, it can only do certain things. This is because it no longer has access to the entire recipe book (genome), but only those recipes which it needs. The cell is then said to be differentiated and the process for making it is differential gene expression. Such gene regulation or differentiation depends on the cell’s environment. We have seen an example where the presence of lactose induces the expression of the lac operon.